A pair of researchers from Rutgers University has demonstrated a new direct numerical simulation in Physics of Fluids, which predicts the flow of RBCs through the body's networks of capillaries. 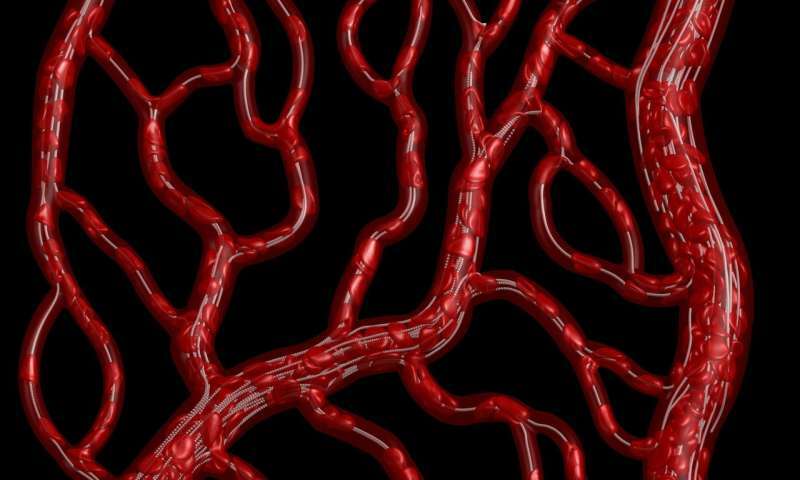 By constructing a network of virtual capillaries, the team found that not only can the flow through so-called mother vessels sometimes become skewed, leading to an uneven distribution of RBCs in daughter vessels, but these junctions also switch between an even and uneven flow over time. "This is the biological problem that has immense significance in healthy states and disease states," said Prosenjit Bagchi, one of the authors of the paper. "These phenomena have been known for centuries, but in terms of high-fidelity computational modeling, there has not been much." Bagchi likens the partitioning of blood cells at bifurcations along blood vessels to cars in traffic where, sometimes, detours happen. Anything from an injury, to a blocked capillary, to a tumor creating new vessels to feed itself can lead to a blood vessel falling out of use. "When it comes to blood vessels, we use or lose it," Bagchi said. "If a city sees that nobody is driving on a particular road, they will stop keeping up with it and might discard it. Microvascular networks are constantly changing their architecture, even in the aging process." A prominent method to model red blood cell partitioning, called plasma skimming, renders red blood cells as infinitesimally tiny dots that move through a blood vessel. Bagchi's group was surprised to learn how much this technique underpredicts the partitioning behavior and leads to highly nonuniform distribution of cells in a network. By considering the effect of the cell size, known as cell screening, the team modelled flow with much less heterogeneity in cell distribution. The group's work casts new light on a longstanding assumption that blood vessel bifurcations either distribute RBCs proportionately or disproportionately with respect to flow. Instead, their findings revealed that vessels can switch between even and uneven partitioning, based on factors including upstream mechanisms that shift RBCs to one side of the mother vessel, bunching up of RBCs at bifurcation points, or changes in flow resistance in the daughter vessels. Bagchi said he hopes his findings and model will prove to be a helpful tool for researchers looking to better understand blood flow in microvascular networks. In the future, his team is looking towards other particles, including how drug particles are distributed, to accurately predict their transport through capillary networks. Could deer hold clues about the link between malaria resistance and sickle cell?